Everybody’s family circumstances are different. For siblings of children with learning disabilities, however, family life is often more complex than it is for their peers at school. In recent years, there has been a growing awareness of the importance of addressing the emotional needs and wellbeing of the brothers and sisters of children with learning disabilities. Understandably, many parents of children with learning disabilities are worried about the effect their child’s disability will have on his or her brothers and sisters. It is important to remember that whilst there are difficulties to be faced as a member of a ‘Specially Blended Family’ (a family that includes members with learning disabilities as well as members without), there are many positive aspects to living as part of a diverse family unit too. Since the understanding that siblings of those with learning disabilities need special support is relatively new, it can be difficult for parents to know where to turn for advice and guidance. Be assured, though - if you are concerned about the effects your child’s learning disability might have on other family members, this is a positive sign. When caring for a child with a learning disability, it is important to consider family dynamics holistically, rather than worrying about the needs of your children on a solely individual basis. Children do not exist in a vacuum. On the contrary, they are highly influenced by those around them and by their relationships and interactions with others. Understanding this is key to supporting the siblings of children with learning disabilities. Foresight is important. If you can identify and anticipate problems that might arise in raising a Specially Blended Family, you will be able to tackle them. For example, a sibling of a child with learning disability may feel that the time and attention their parents or guardians give them is limited. If you are worried that one of your children may be feeling neglected, take steps to remedy the situation. Take care not to overprotect your child with learning disabilities, or let the disability dominate your family. Instead, make family life a priority. If you need to spend time away with one child, for a specialist appointment, for example, try to make up for it. Balance is key. Make a point of spending quality time with all your children on an individual basis, as well as spending time communally. Siblings of children with learning disabilities often worry about bringing school friends home to play. Be sure to stress to all your children that their friends are welcome in your home. Encourage them to bring friends home to play. To save time and effort, consider designating a particular afternoon when all your children can invite a friend over. Your non-disabled child is unlikely to feel pressurised, embarrassed or stressed if their guest is amongst other guests. Stress in the home may also impact upon siblings of children with learning difficulties. To combat this, ensure that all your children have a hobby they enjoy and which relaxes them. Whether it be a sport, a craft or a particular game, it is important for children to have an activity that is important to them brings them comfort. If your family are going through a particularly stressful patch, consider asking a friend or relative to entertain your non-disabled child for a few hours. A break from the hubbub of the home and a bit of extra attention may be just what they need. What’s more, they might be able to enjoy an activity that you are not able to engage in as a family. Children often feel resentful or angry towards siblings with learning disabilities. They may even feel guilty or embarrassed about their family. They might feel worried about the future of their brother or sister. Such feelings are perfectly normal and they should be made aware of this. Take the time to listen to your child and to understand their concerns. Take them aside, have a private conversation and encourage them to voice their feelings. Once you know how they feel, you will be able to take steps to improve things for them. There are several key advantages to growing up in a Specially Blending Family. Siblings of children with learning disabilities are often great communicators, adept at engaging with those with different needs from them. They are often independent and responsible and good at caring for others. Take care to celebrate such strengths. As well as making small changes to your day to day family life, consider looking for a sibling support group in your area. Such groups give siblings of children with learning disabilities the chance to interact with other young people with similar family situations. Here, children can share their feelings, frustrations and experiences. 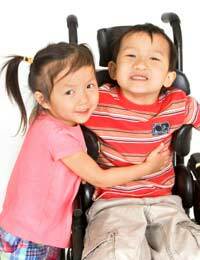 They can also learn more about their sibling’s disability and consider the ways in which it impacts upon them as an individual. They can also learn day to day strategies for coping with problems and issues that might come their way. Contact your local council to find out if there is a group like this in your area. Alternatively, take a look online. Site such as sibs.org.uk offer advice and support for the brothers and sisters of children with disabilities. In addition, don’t be afraid to take your child to see a GP. Counselling or family therapy might benefit your child. Finally, be sure to look after yourself as a parent. Managing a Specially Blended Family can be draining but it can also be hugely rewarding. Take the time to relax and recharge so that you have the energy you need to support all your children.